A Man Without A Country is a collection of essays, speeches and drawings in which Vonnegut reflects on politics, religion, art, and human nature. It was the last book that was published before Vonnegut's death in April of 2007. The collection is a delight to read; though a bit disjointed, overall it's funny and incredibly sincere, it's moralistic, and at times biting. Vonnegut discusses war, the bombing of Dresden and how it lead to his classic Slaughterhouse-Five, he examines the coincidence and hopelessness of life, our less-then-ideal government, the bleak state of the environment, and how he feels helpless in a world where most of us focus on the now, rather than the state of the future. I don't think people give a damn whether the planet goes on or not. It seems to me as if everyone is living as members of Alcoholics Anonymous do, day by day. And a few more days will be enough. I know of very few people who are dreaming of a world for their grandchildren. 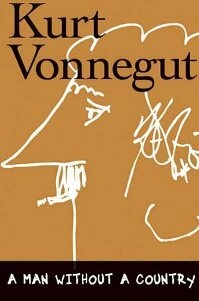 Despite the fact that Vonnegut was painted as a bitter, angry old man in his most recent biography, from these essays it seems to me that while he was disillusioned with the state of America and society as a whole, he did maintain a certain faith in people and the good of which they are capable. Moreover, Vonnegut stresses the importance of acting in kindness and advises to pay attention to moments of happiness, lest they should pass you by wasted and unnoticed. It's a simple piece of advice that is overlooked by many. It's also a testament that while Vonnegut was cynical and pessimistic about a lot of things, he truly took the time to appreciate his happiness what was good in his life. I urge you to please notice when you are happy, and exclaim or murmur of think at some point, "if this isn't nice, i don't know what is." I think part of the reason I enjoyed this book so much is because I happen to agree with its outlook and politics. The essays are meandering, but it works. If you're a fan of Vonnegut's novels but haven't read any of his essays, I urge you to read this book. I'm glad you enjoyed it! I still think it's odd that his last book was my first. I was in downtown Indy yesterday (his hometown) and someone just painted a giant two story picture of him on the side of a building in the art district. I was so excited! I loved this one! I was a bit of a late-comer to Vonnegut. The only title I read while he was alive was Cat's Cradle, but reading his complete works is on my to-do list. My own copy of this one is marked up like crazy-so many little pieces of wisdom! I've had a hard time getting into Vonnegut's books, yet I really admire him as a thinker. I'd like to add a copy of this to my TBR shelf fro the new year. Allie, I still haven't read Cat's Cradle. When I got onto Vonnegut I was all about his short story collections. I'm glad you liked this one too and yes, there is a LOT to mark up! Trish, You should try it out. If you like his thinking I bet you'd like this. I certainly do agree with his thinking on the future of the planet...I think I'll add this to my wish list. Thanks for the recommendation! It looks like the next logical Vonnegut step for me. I love essays. Debbie, Sure thing! Glad you found it interesting. Ben, Nice looking forward to your thoughts. 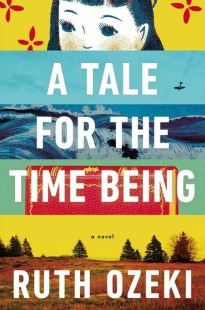 The Kurt Vonnegut Memorial Library book club in Indianapolis read this one as our December book. I just posted my comments about it and will be appending our club's unofficial secretary's notes on the meeting soon. I've seen the mural in downtown Indy too. It is HUGE! They're doing/have done a lot of murals all over town, I guess as part of our pre Super Bowl hosting tidying up.